Mateo's Choice (Digital PDF) | FutureFlyingSaucers. I love the format of this book! It does such a good job of explaining words and concepts in an easy way. 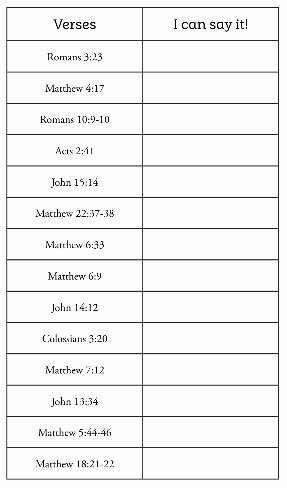 This is a great discipleship tool. I was extremely impressed with Mateo’s Choice and can’t wait to share it with my daughters. 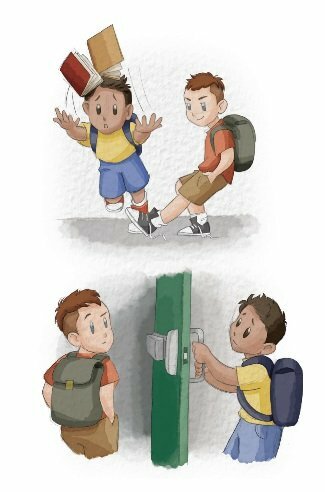 The illustrations are eye-catching and draw you into Mateo’s story. I love that children will easily be able to relate to the storyline and see Mateo’s thought process as he travels the path to salvation. I love the questions that are provided to help parents engage and interact with their children. This is definitely a powerful resource for parents and anyone working with children! I am so excited to have this resource for discipling kids, my own and ones I teach! I am looking forward to sharing this book with my three-year-old as he is asking lots of questions about putting his trust in Jesus! 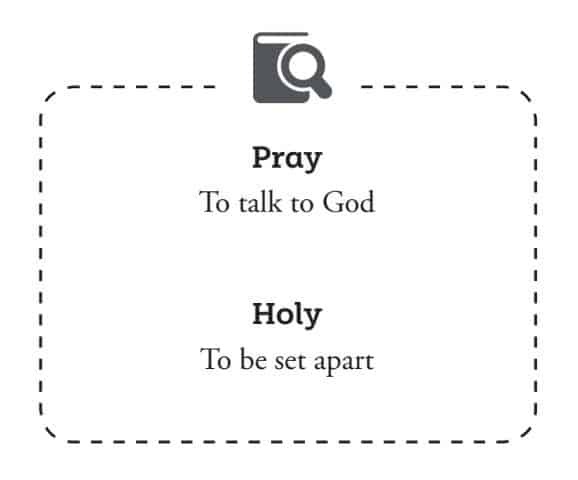 Anne Marie has put together a Biblically-based, easy to use, and a wonderful tool for discipling kids as they consider what it means to have a relationship with Jesus. I am already imagining how many ways I can use this book in ministry! Another great resource from Anne Marie Gosnell! Mateo’s Choice does an excellent job of answering the question of what does it mean to choose Jesus as Lord as we follow along with Mateo on the journey to answer this question, we discover what it means to be a child of the King. With beautiful -Christ centered illustrations this book explains Basic Discipleship for Children. 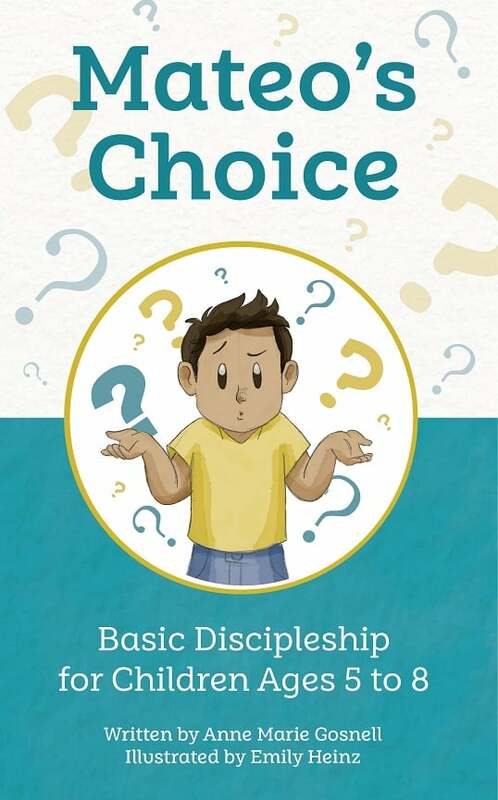 Mateo’s Choice is a wonderful discipleship resource. This book is written exclusively for children ages 5-8 years of age and that is what makes this book so unique. It contains simple yet direct text and colorful engaging illustrations that have been crafted to capture a child’s wonder and imagination. The author and illustrator also extended and deepened the opportunities for discussion by including above each illustration a row of blocks that utilize the color system of the CEF’s Wordless Book. This thoughtful detail provides another view of the steps in the process of Mateo’s Choice to follow Christ and His teachings. This sweet book would be a valuable addition to any and every Primary Sunday School Class. It would also be a wonderful resource for any Children’s Ministry to bless their Parents whose children are just starting school. This book would be a great tool for parents to have to help equip them to disciple their children. This would also be a great tool to take on both foreign and domestic Mission Trips. 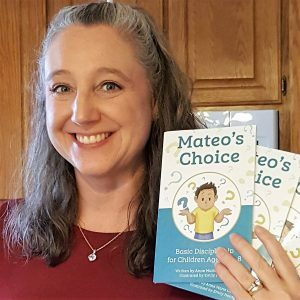 I purchased a copy of Mateo’s Choice for my home and for my church. I highly recommend this sweet book! Amazing! This book truly surprised me because when you get it you think it’s just going to be something for the kiddos but no way! This is something for the whole family. This is something that can be used at church or to hand out. I love this book and can’t wait to share it with others! It’s so simple to understand but so heartfelt and it’s all backed up with biblical truth which is most important. It’s a must have! We just got our book and we love it. My older two children are older but really enjoy our time together reading and talking about Mateo’s Choice. Ms. Gosnell has done an great job at explaining what it means to be a Christian in a fun, easy to understand way for children complete with wordless images,memory verses, and a glossary for the young readers. It also allows you to be able to fit it to your specific denominations rituals and practices. Today I read Mateo’s Choice and i feel it is an excellent faith based children’s book. I absolutely love what I read. It is a great children’s book in my opinion. It is direct, to the point about what Jesus wants us to do and how to be saved, about baptism, about forgiving others and so much more than I even imagined it would have in it. It seems to me it is easy to read and easy to be understood for all ages who can read or have it read to them. I love this book and that it has scripture references to each part of the story as well as other helpful information at the end of the book. This book I believe would be excellent for Sunday school classes and children’s camps, etc as well. I would highly recommend this book to parents, churches counselors, etc for them to give to children, classes and groups. You will not be disappointed if you order this for your children or your church. This book is right on target for children who have been raised in the church and exposed to many of these concepts beforehand. As a great resource for a parent, Sunday school teacher, and children’s minister, it can be broken up and used for a single concept per class period or sermon. I was not familiar with the “wordless” concept, but was delighted to see it utilized in this marvelous children’s book. Appropriate for ages 5-8, I think that it would be a great read for anyone who might be confused about what it means to follow Christ. The illustrations were perfect. A book that I would be happy to share with any little ones in my life.